At present, eCommerce market is totally overstuffed with effective platforms, capable of bringing your online shop into the limelight. Nevertheless, some merchants rise to the top, getting everything that they want, and others take places at the back of success, enviously watching. So, who do you want to be: an observer or a master of fate, holding all the cards? If the latter, keep reading and be attentive. In this article, we’re going to pit Weebly vs WIX vs Shopify against each other to make them take off masks. No preconceptions, no prevarication, no judgements, only truth-telling and fair assessment. One of the core skills you need to be good at eCommerce is picking only the best. Always. And we know, how to choose right website builder, that will work with your business as efficiently as possible. Fasten belts, guys, the party is getting started! Just intending to reach pretty high, make the enjoyable clients’ experience your number one focus and priority. Have customer’s voice in mind, and try to realise how to prompt visitors to take action. Too complicated? No big deal, Cart2Cart is your rescue ranger. Imagine web wanderers visiting your site for the first time, what do they expect to get from you? Truly beautiful, functional, appealing, easy-to-use eStore, equipped with a lot of options for the optimisation of the shopping process, that doesn’t require them to spend all day along to find something. Not a lot, but not a little either. Let’s look closer to determine which of these platforms can accomplish such a task. Weebly contains a variety of essential tools that you can use for building a website or store from scratch. Its set of templates now includes a great choice of on-trend mobile-responsive designs. Unlike Wix and Shopify Plus it allows you to download the full code to your website so you can customise it, but if you don’t have access to tech talent, that advantage makes no sense. Weebly also has 40+ pre-designed themes and layouts for every type of page to help you get started. The platform enables each user to add and install more helpful apps and lets you create a fully customizable club and have full control. There are beautiful, professionally designed modern themes, drag and drop interfaces, and bling - a third party plugin gallery. Officially launched in 2006, WIX is a well-known drag-and-drop sales panel, that hit over 130 million signups in over 190 countries. It’s more appropriate for small and medium-sized businesses, looking to give life to an online store quickly, cheaply, and with ease. Wix helps you not only to create free websites but also it provides you with lots of designs and templates. Their development team is continuously improving their service and adding features. The very best aspect of using Wix for your website hosting is the ability to build your own site from the ground up or use one of their many beautiful templates. Established in 2007, Shopify can boast the extremely rapid growth in popularity. This platform currently powers over 160,000 retailers in 100 different countries, among them: Tesla Motors, Gatorade, Forbes, Amnesty International, Encyclopedia Britannica, Maxim Magazine, CrossFit, Black Milk Clothing, Herschel Sup. If you need a clean, responsive, smartly designed eCommerce site, then Shopify is for you. No programming knowledge is required, and there are many stunning templates to choose from. It is an excellent choice for migration because the sales panel offers a PCI compliant, secure shopping cart and payment gateway solution. When it comes to migration and new, unfamiliar platform with various features and secrets you’re going to learn, every freshman needs a guide, put merely, knowledgeable customer service. Weebly provides users with help available only 6am to 9pm Monday to Friday, and 8am to 5pm on weekends. Regarding phone support, that’s where hidden charges hit the floor: you should upgrade to a Pro or Business plan for that exclusive option. In spite of Wix popularity and high rating, there are always loopholes. This platform doesn’t offer help via live chat and makes you pay more under the guise of “priority” for getting phone support. Moreover, their knowledgebase leaves much to be desired and does not have the attention or the depth that Shopify has. Admittedly, in a Weebly vs Wix vs Shopify face-off on customer support, Shopify is the clear winner. This platform provides numerous support channels on each plan 24/7. No matter how many times you ask for help, or how basic your questions are, their experts know their stuff and deal with it correctly. Such top-quality service is polite, competent quick to respond to your issue and always offer helpful solutions. Let’s set the record straight, not to deceive you. 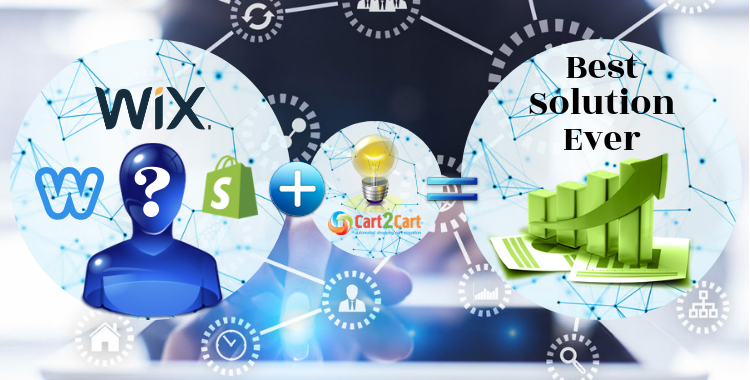 All eCommerce platforms try to reach the top quality and acquire such features and tools, that other counterparts cannot. However, what’s the purpose of this race and what’s prize? Money of course! We dislike it as well, but you have to realise - there’s nothing genuinely free or cheap concerning online business. The only choice is to save every penny for keeping body and soul together or invest in a giving spirit today for having the whole world at your feet tomorrow. Comparing pricing policies of Wix versus Weebly versus Shopify is taught question, cause it’s like comparing bicycle vs SUV. If you’re not going to take on a long trip with a whole bunch of luggage, the first option may be completely satisfied and relaxed on the wallet. But two vehicles are far from being horsepower, yeah? Weebly has on offer 4 paid plans to choose from (price ranges between 8 and 38$ per month). It’s 13% more expensive than Wix, but each of the options covers basic features right up to advanced eCommerce functions. You’re also able to use unlimited free plan and stay on it as long as you want. But keep in mind, that to sell products, you must be on a paid Weebly plan. And to sell over 25 products, you must be on the Business plan (with Shopify you can sell unlimited products on any program). Above all, to get the SSL certificate included as standard with Shopify, you must upgrade to the Business plan on Weebly. Wix proposes 7 paid (3 eCommerce and 4 website ones) and free plan as well (prized from 5 to 35$). An ad-free site costs $120.00 a year. Remember that the Connect Domain plan doesn’t remove the advert from your webpage. To get rid of it, you have to go with the Combo or Wix eCommerce plan. If you use a paid third-party app from the App Market, its fee is charged on top of the standard Wix fee. Do you fill it? Seems like you’re getting screwed. Let’s face it, being a fully-fledged platform focused on *only* online store owners whereas Wix markets to everyone, Shopify is more expensive (prices range from 29 to 299$ per month). 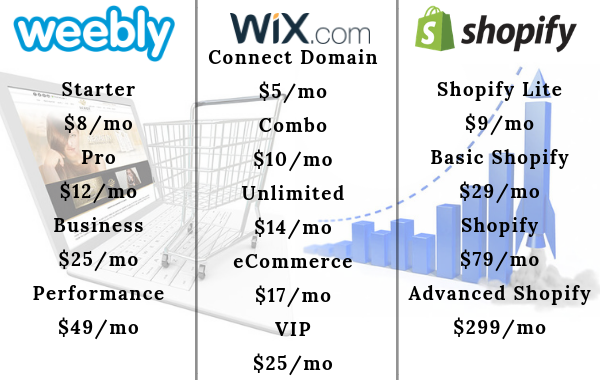 The cheapest online store plan ($29 monthly) has a higher price than Wix’s most expensive one ($25 monthly). Having said that, Shopify offers many more features on their cheapest plan than Wix does on their most expensive. 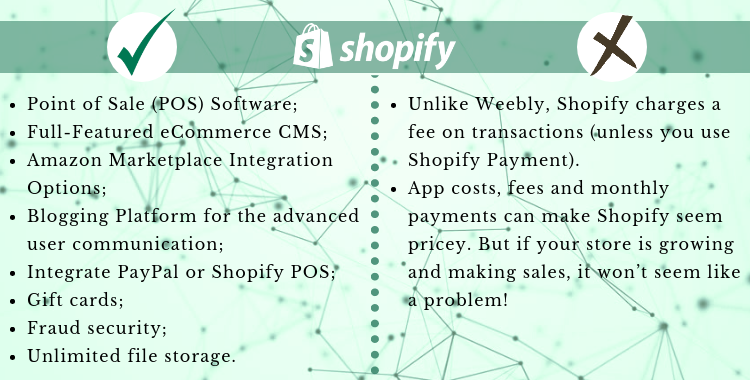 If money is your most significant sore point, Shopify Lite (9$ per month) is a perfect fit to consider. Going with that option allows to sell on FB, chat with customers on Messenger, add products to any website or blog and accept credit card payment. Good design is eliminating all unnecessary details. Sounds easy? Actually, not at all. A lot of merchants can spot a good looking eStore but have a harder time figuring out how to get there. If the webpage discourages visitors, its usability, robustness, loading speed and a broad range of high-quality products have no point. Weebly tends to simplicity, clarity, brevity, and its templates reflect that. They may be more fundamental than Shopify’s, but they’re crisp, stylish and well-designed. There are 3 types of customisation, depending upon your tech talent, development skills and experience of web-design: a user may use readymade templates, customise a theme chosen or create and integrate a personal model. 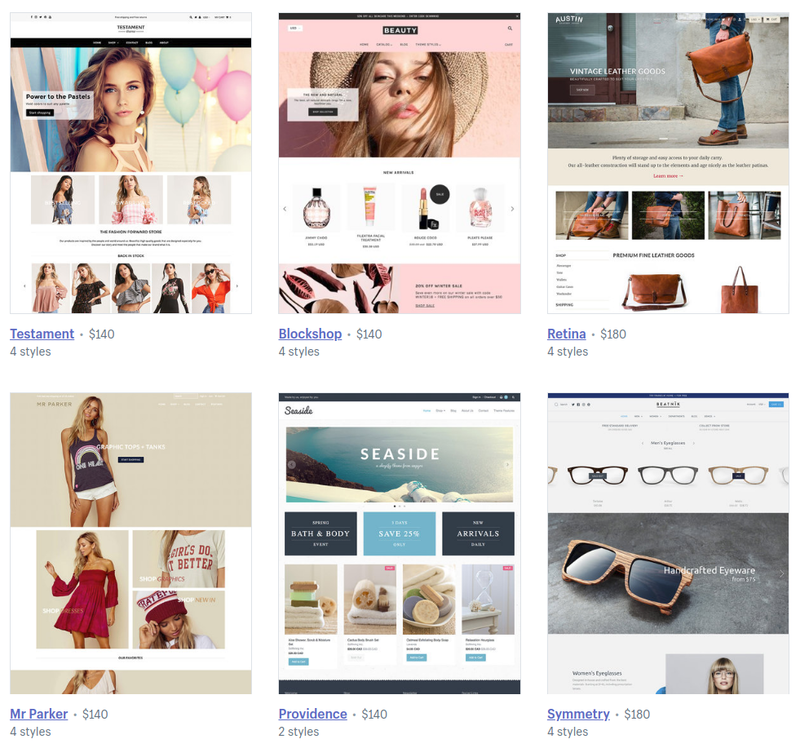 Weebly’s theme store has 15 design options for eShops and merchants can be impressed with how well-executed they look, but there is less variety than Shopify. All themes are mobile-responsive, and you can switch them once your site had gone live. In terms of design, Wix definitely has a room for improvement. The sales panel provide 550+ professionally-designed, mobile-friendly templates; however they cannot be changed easily, and coding isn’t inbuilt into the editor. In other words, Wix store does not allow for writing actual HTML/CSS. So if you want exact customisation, we’re sorry, you’re out of luck. The most significant drawback about all templates – you can’t switch them midway through the editing process, so think about this carefully before you decide which theme is the right one for you. Shopify is an eCommerce market-leader and extinguishes competitors in this nomination since everything here aims to enhance sales. Shopify offers more than 100 professional-looking themes, ensuring the creation of elegant, sophisticated websites for your eStore. It is also compatible with mobile shopping and has ready-made email templates for your communication needs. You can browse themes by industry, some come with the chosen plan, others cost extra, starting from $140. There’s no obligation to use paid templates, but once you’re making sales, it might be a good investment. The thing to bear in mind is that Shopify’s themes don’t just look great, they’re greater towards selling, developed by famous designers like Pixel Union, Happy Cog and Clearleft (free and paid), Shopify custom made themes and HTML/CSS editing options. Weebly App market contains over 300 extensions, and new applications are added regularly to extend your website. Additionally, 50 of them are free, and you can even submit your own ideas for new apps. Also though Weebly focuses on simplicity, the App Center means you can expand your site quite quickly. The extensions listed in the store can be added at the click of a button, so there’s no messing around sorting out the integration. The apps are fully-integrated – you won’t need to customise any code to add them to your site. 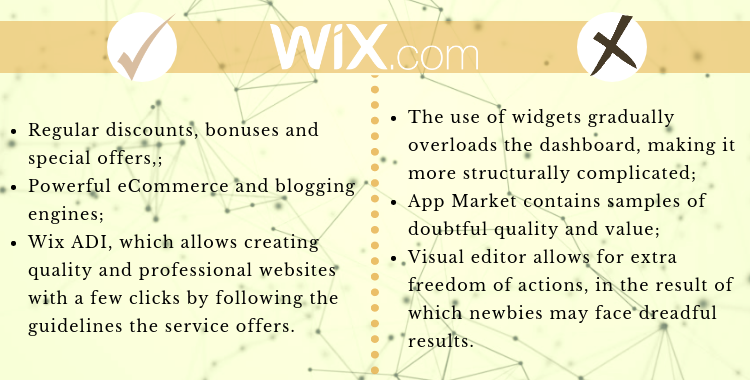 Wix’s range of applications is pretty smaller (over 200 apps), but they may be as in-house, so third-party. The extensions are all well-developed and have high functionality, ranging from ecommerce like Wix Stores to adding social features like Facebook Comments. Shopify’s App Store is one of the best in the business. You can choose from over 1200 reasonably straightforward and easy to implement apps, covering social media integration to taxes. What does it mean, limitless? Realise with the range of Shopify extensions. These apps don’t just let you add fancy new features and extend your store. They free up your time by doing mundane jobs for you. You can then get back to what’s important: enhancing functionality and selling products. What’s the good of being smartly-designed, easy to use and handy, if nobody knows that and can’t find your eShop within top positions of the search engine? That’s why SEO capabilities become such crucial and dependable criteria when choosing eCommerce platform. Concerning on-page SEO, you’re hardly stand out from the crowd in this respect with Wix. It also uses Google Analytics, the industry-leading standard in website and mobile intelligence. Weebly’s SEO functionality is thoroughly incorporated into the Web that enables it to obtain organic traffic from most search engines quickly. The same is true with Shopify, as it has efficient, robust SEO support and analytics features. 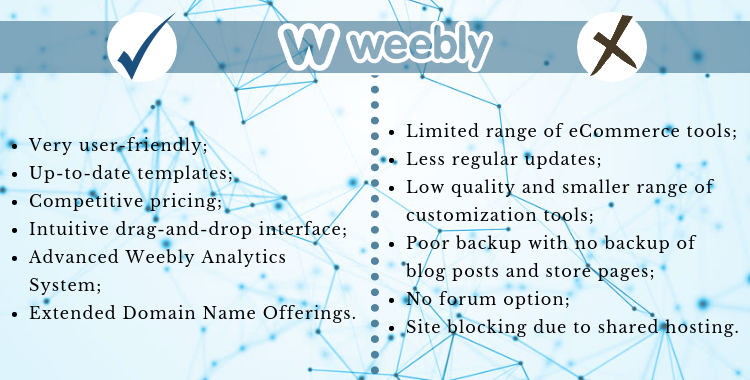 Weebly comes with clear, understandable interface and good-looking dashboard, that ensures quick and simple access to the data, blog comments, product description, web-page statistics, useful tips and store orders. No coding skills and web development experience are needed since all the content you will add to the page falls into specific containers (boxes), when you drag and drop it to the page. Due to this approach, you won’t face problems when transferring the content you need from one theme to another. Wix is a drag and drops website builder as well. While with many popular platforms you can drop the elements to certain areas/blocks only, working with Wix you’re free to place those literally anywhere on the page. This approach is also known as ‘absolute positioning’, and unfortunately, it makes it impossible to move your content to another Wix theme, since it is scattered all over the page and has no fixed structure. Such a method gives users full creative freedom but may cause many inconveniences and difficulties in the future. As for Shopify, you just won’t be able to spoil something there. That’s why this sales panel is a smart choice for those users, who are going to switch to this platform from another one. Even if you’re non-technical, it’s effortless to master Shopify. And remember, quality support is just a phone call or e-mail away. In your store editor, too, help widgets guide you through building your eShop step by step. Simply put, even if you really try, you will break nothing out there. Both Wix and Weebly are quick, easy, and get the job done. If you just need a clean, basic website for a startup, that communicates what you need to say, and you don't want to waste a lot of time doing it, this is a good go-to. But you're not going to build the world's most significant site with them, let's not kid ourselves. Shopify is the best platform for drop shipping and also for retailers who want to take all possible benefits. Anyone with no previous experience in web-design can also easily set up a shop and start selling globally. The dashboard is very user-friendly, and they also have tips and instructions displayed upfront to help you set up quickly. It also has a 14-day trial that allows you to set up things and check out if your products are working. 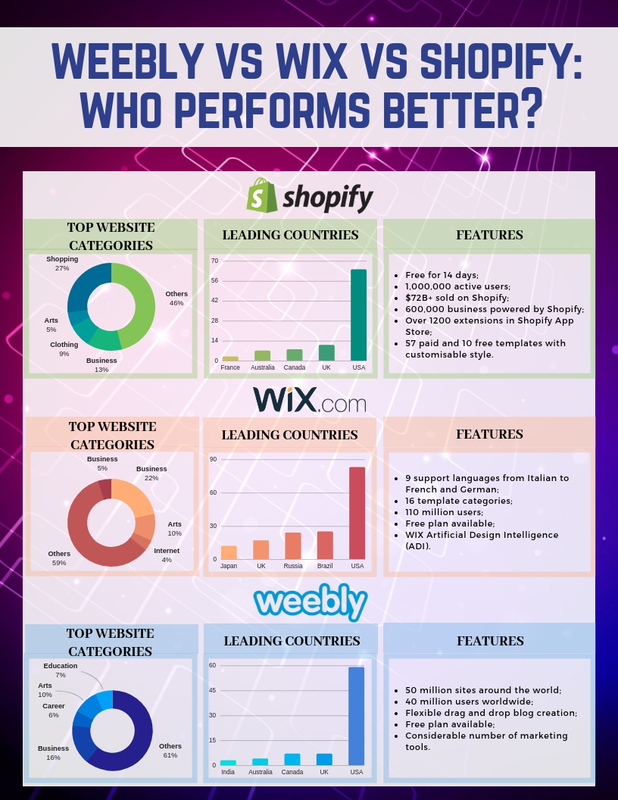 It was a taught challenge to compare Weebly vs Wix vs Shopify for eCommerce, but we’ve overcome that and can conclude: migration from Weebly or Wix to Shopify will upgrade your business significantly. In a nutshell, we have three great options, but Shopify takes the cake. For bigger businesses looking for an all-around, top-notch eCommerce solution, this platform is clearly the better option. It’s user-friendly, flexible, and loaded up with features to help your business thrive. And if you want more than your current sales panel can give, don’t wait! The professional looks and impeccable performance Cart2Cart rewards its customers with would cost an arm and a leg to be implemented independently. You should probably have known that from fellows who get their feet wet in eCommerce and didn't succeed. Try Free Demo and migrate to Shopify, leaving behind all empty moments and fails. Your dream store is a matter of a few clicks!